A couple of weeks ago, we were approached by a property owner looking for a commercial energy assessor in Exeter. Since then, we have been busy working in and around Exeter carrying out EPCs for this client. The landlord contacted Up Energy, via his commercial estate agent, to seek our help in assessing various properties within his ownership, to check the EPC ratings. We have previously carried out one EPC assessment for this client, and multiple other assessments for the property agent. The landlord owns both non-domestic and domestic buildings and wanted assessments carrying out so he is aware of the EPC rating of each property, in preparation for the new legislation coming in to force on 1 April 2018. The commercial buildings fell into one of two categories; industrial or retail. The domestic properties were above the commercial retail units. The industrial units were fairly typical of the period of construction, around the early 1980s. By then, there was some insulation in buildings, albeit a limited amount. Some roofing had been upgraded and had a better thermal performance, thus reducing heat loss. 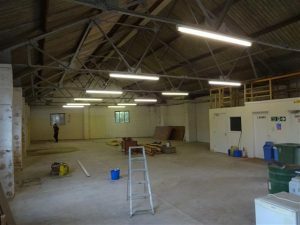 The units were a mixture of warehouse storage and workshops. Each unit typically had a small area for ancillary use, such as an office, tea room and toilet facilities. In general, the large warehouse and workshops were unheated, with just the office space having basic electric heating in. Lighting was typically fluorescent, as is usually the case with commercial property. The retail units were fairly straightforward. Again, fluorescent lighting on the whole, however one unit had been refurbished by the tenant and modern, LED panel lighting had been installed. Small retail spaces often do not have complex heating systems and this was the case, with small electric heaters doing the space heating. How an energy assessor in Exeter can help you? Up Energy have experienced and well qualified energy assessors able to offer expert advice on how to improve the energy efficiency of a building. Common thinking is to focus on insulation; this is certainly important and a fabric first approach is recommended in a lot of cases. Domestic properties often benefit more from improved insulation. Whilst the same is true for commercial properties, because heating patterns and lighting requirements are completely different, the heating plant and lighting type has a big impact also. In the case of this client, some simple lighting upgrades, installing LEDs for example, would improve the EPC ratings significantly. Some of the units had reasonably energy efficient lighting already but improving the controls, by having them automated, rather than just a manual on/off control, improved the energy efficiency sufficiently to move it from an F rating to an E rating. If you need a non-domestic energy assessor in Exeter then get in touch with Up Energy today and we will be happy to help. If you have a large portfolio or just a single property, we can provide advice on how best to improve the energy rating of your building. If you just need an EPC for selling or letting purposes, then we can do that too.